December 18th, the Sunday before Christmas and some 36 Striders turned up at Maiden Castle for our annual romp around Houghall Woods in ridiculous outfits to work up an appetite for Sunday Lunch at the Court Inn. And possibly to go home with a bottle of wine, some chocolates or a lunch voucher. Only a few prizes were for actual running – first finisher, fastest man, fastest lady and 1st Junior. The remaining 18 prizes were for fancy dress so the competition was fierce! 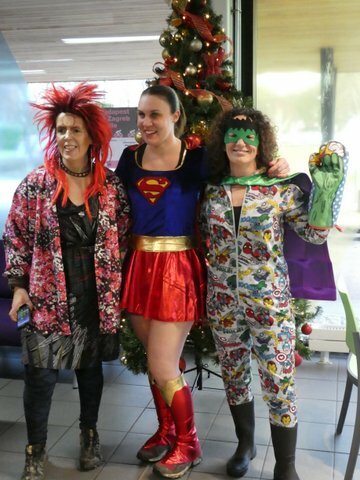 The theme was based on a choice of two lines from David Bowie songs, in honour of the great man who died last January: “We can be Heroes just for one day” or “Scary Monsters, super creeps” – an alternative spin on Heroes & Villains I guess. From about 10.30 various startlingly colourful creatures just kept on arriving at Maiden Castle, to the astonishment of the reception staff. Only one Bowie but several Super Girls, Donald Trump, Jeremy Corbyn, three ‘Evil Sisters’, the Riddler, Ginger Spice and Tina Turner to name but a few. Phil and Mike Hughes had been checking the course and marking any ‘hazards’ so at 11.00 we could make a prompt start. Of course there was the usual disbelief and mock horror at some of the handicap times given. Cries of, “That’s a ridiculous time for him” or “She must have a magic watch!” rent the air. However, the mockery died down and Starter/Timekeeper Sue set them off – subject to their highly suspect handicap times! Some found running easier than others who might have been somewhat handi-capped by their chosen outfits! Passing motorists were certainly highly amused. Then after much shedding of tiaras, cutlasses and other accoutrements, runners began approaching the finish. First past the post was Mike Bennett in 38.04. Mike was absolutely delighted – in 29 years as a Strider he had never ‘won’ the Christmas Handicap. And he’s run most of them! Fastest man was Michael Mason in 30.26, fastest lady was Louise McCloy in 38.23, fastest Junior was Erin Keeler-Clarke in 38.04. 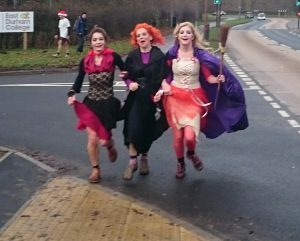 The last finishers were the three evil sisters, Elaine Bisson, Lesley Charman and Katy Walton. Afterwards, runners, supporters and marshals retired to the pub for lunch and the prize giving. Santa, ex-chairman Nick Young, presented the prizes, mainly for fancy dress as chosen by his two elves, Janice Young and Gill Wesson. It was another very enjoyable Strider social event and I’d like to thank all those runners who took part, most in some sensational costumes. Thanks also go to the Start/finish team Sue Jennings and Phil Owen, the marshals, Mike and Phil for their work on the course and of course to Santa who always does a great job.